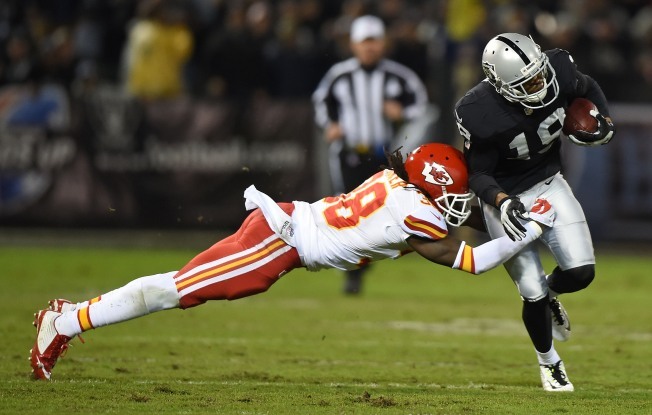 Vincent Brown #19 of the Oakland Raiders is tackled by Ron Parker #38 of the Kansas City Chiefs during the game at at O.co Coliseum on Nov. 20, 2014, in Oakland, Calif. The Chicago Bears missed out on another potential free agent target on Saturday morning, as safety Ron Parker agreed to a five-year contract to remain with the Kansas City Chiefs. The deal will pay Parker $30 million, and it represents a big commitment from Kansas City to hold onto the safety. In 16 games last season, Parker had an interceptions, 12 defended passes and 84 tackles for the Chiefs, and at 27 years of age, the team has locked him up to a long-term deal. The Bears have missed out on a couple of potential targets in recent days, with wide receiver Kenny Stills getting traded to the Miami Dolphins and nose tackle Terrance Knighton signing a one-year deal with Washington. Parker would have been a nice addition at the safety spot to go along with Antrel Rolle, but with that kind of financial outlay, the Bears have clearly decided that they would be better off spending money elsewhere. The team could still be looking at help at the inside linebacker position (Mason Foster has been rumored to be discussing a three-year contract with the Bears, but seems like he’s in no hurry to decide), and there are still nose tackles like BJ Raji and CJ Mosley on their radar as well. Cornerback Tramon Williams could also be a potential fit as the team looks to replace Charles Tillman.